Getting your wisdom teeth is often seen as a sign of reaching adulthood, but the process does not always go smoothly. Not all wisdom teeth manage to escape from beneath the gum and bone, and being trapped can lead to problems such as infections or cysts developing. Even wisdom teeth that do erupt can be affected by decay. Listed below are some of the most common problems that can affect wisdom teeth. Your dentist might recommend that your wisdom teeth are removed if they fall into one of these categories. Wisdom teeth that have failed to escape from the gum or jawbone are called impacted. Some impacted wisdom teeth point towards the front of the mouth, in which case they may press against the roots of neighbouring teeth, causing serious damage. Wisdom teeth that are interfering with surrounding molars should generally be removed in order to protect the other teeth. Many wisdom teeth are partially impacted, which means that they have broken through the gum but have not fully erupted. Partially impacted wisdom teeth are often partly covered with a flap of gum tissue. Food can get caught underneath this flap, which encourages the growth of bacteria and can lead to an infection. Infections of the gum tissue surrounding a wisdom tooth are often very painful, and usually cause swelling as well. You may also get jaw ache or a bad taste in your mouth. Infections should be treated as quickly as possible to prevent them spreading and becoming more severe. Wisdom teeth can develop cavities just like your other molars do. In fact, because wisdom teeth are often so difficult to clean, they are even more likely to be affected by decay. Cavities in wisdom teeth can sometimes be filled, but your dentist might recommend removing the tooth instead. Your dentist can advise you about the risks of your wisdom teeth causing an infection or damaging your other molars. Regular dental visits are important for everyone, but young adults who are beginning to get their wisdom teeth should take particular care not to miss routine check ups. 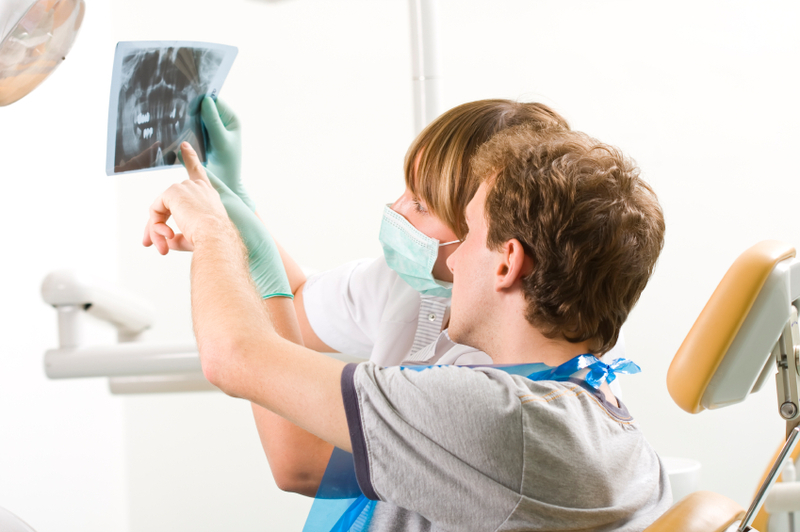 In addition to examining your mouth, your dentist may also take an X-ray of your wisdom teeth to check their positioning below the gum line.